A male 26 y.o. 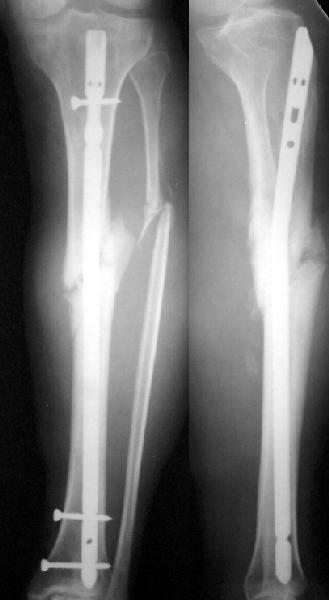 sustained closed tibial shaft fracture after a car accident (pedestrian injury) Feb 7, 2002. In a small local hospital the Ilizarov fixator was applied, reduction was poor. 3 months later it was removed and replaced by plaster cast. The patient reported after ex-fix removal mobility at the site, no wire tract infection. A month later he himself decided to take off the cast. Now walks with cane and limp, marks pain over the site. No obvious mobility found at examination. Recent films (AP and 3/4) attached. What diagnosis is correct to date? Pseudarthrosis? Delayed union? Something else? We plan to nail it "as is" with dynamic locking. Is closed osteoclasis necessary here? Should fibular osteotomy be performed? Any other additional measures - bone grafting? Regarding case of 26 yo patient with tibia shaft fracture that has gross motion 8 months after XF and casting. Diagnosis? IMHO this is a delayed union with impending nonunion. 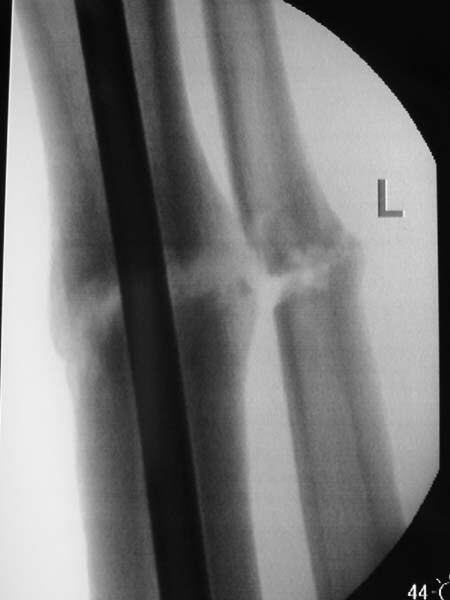 The time difference between delayed union and nonunion varies; sometimes referred to as 1 year, 9 months or 6 months; sometimes twice the normal healing time ( 2 x 16 weeks for tibia shaft); sometimes other considerations. IM nail is a good treatment choice for this patient at this time; although concern about infection exists. (multiple prior discussions here). 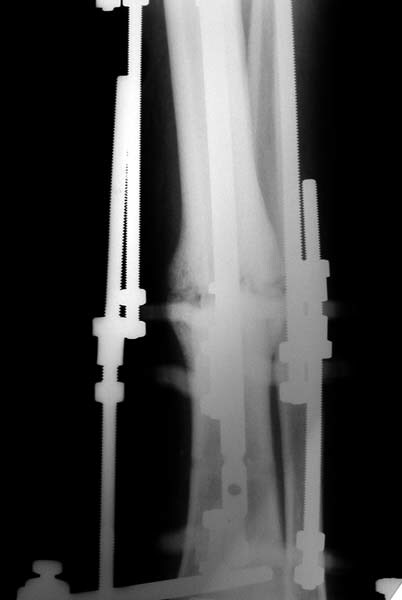 The fibula appears healed and should be osteotomized (perhaps remove a short segment) in the shaft. The reamings will suffice for bone graft. Iliac graft or commercial substitute unnecessary. Closed nailing is probably achievable and slightly preferable. This can be made easier by use of a "pseudarthrosis chisel" or other stout device to open the "sealing callus" over the ends of the bone and facilitate passage of a guide wire. Obtain and maintain reduction as much as possible to avoid problems with malunion. Only if you have to open the fracture would I remove the fibrous tissue from the fracture site. If so then pack reamings in the gap. Lock proximally and leave some room in the medullary canal distally to axial load to compress a bit. This delayed union needs stability and fibular osteotomy. My preference would be fibular osteotomy, decortication and grafting of the delayed union and application of a stable Ilizarov construct. Any fine tuning alignment correction can also be achieved. Mr. Peter Hamilton MBBS(Hons. ), FRACS(Orth). PH> My preference would be fibular osteotomy, decortication and grafting of the delayed union and application of a stable Ilizarov construct. No hollow reamers and nails are still availble yet, so UTN 10 mm was used. After perQ osteotomy of the fibula i tried to open the canal, and the awl was passed to the distal fragment only after closed mobilization of the site to make some antecurvation. It resulted with some anterior translation of the distal fragment :( After impaction the nail was locked dynamically. Images attached. Comments/critics are welcome. I agree. The non-union looks like a 'stiff hypertrophix non-union'. So, leave the nail in-situ. Remove the distal inter-locking screws. Apply an Ilizarov frame and initially distract and later compress. Luckily, the fibula has not united. There is no doubt that the Ilizarov is a versatile tool for this problem. Much less invasive than other methods. However, it is surgeon and patient labor intensive, and requires long rx- 7.5 months in the poster (on a tough group of patients). In the states, it is an expensive implant. The UTN will likely work if the stability is good enough, but track record of reamed nail is better if infection is avoided. I would have performed a compression plating- simple, quick, cost effective, no immobilization, and early functional aftercare. No bonegraft. Results in published reports are good, and mirrors my experience. Patient acceptance excellent - much preferred to ex fix. Aftercare simple. So if its my leg, I'll take the more invasive initially for the later benefits. 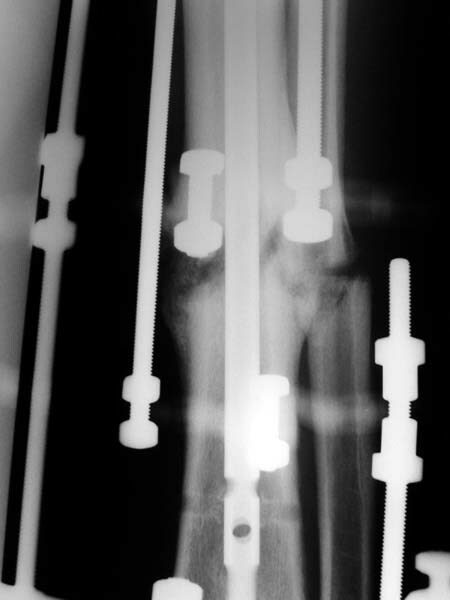 Thank you for the interesting ex-fix distraction osteogenesis nonunion rx reference and images. There was a time when distraction secondary to ex-fix caused it to have a reputation as a "nonunion machine" and distracting a fracture over a nail was not well regarded. Maybe 2 wrongs make a right. Why add compression? According to Hart et al JBJS 67A:598, ex-fix compression has no osteogenic benefit. Cyclical distraction and compression has an osteogenic effect on fracture healing a la dynamisation. We (Patel, Paley, Herzenberg et al - www.aaos.org/wordhtml/anmt2002/poster/p441.htm) have shown in our (hopefully soon to be published) series of 88 consecutive cases that Stiff Hypertrophic non-unions regenerate bone with distraction alone, and partially-stiff non-unions have to be 'stimulated' (per Aronson) by compression (to set of an inflammatory osteo-clastic reaction) and then distracted for osteogenesis. We have have horrendous, multiple operated (>4) limbs with deformity and shortening, with poor soft tissues that have united with distraction alone, without opening the fracture and without bone grafting. Even broken hardware (plates, nails) is left intact. Circular Ilizarov type fixators provide dynamic controlled distraction as against the static distraction caused by nails or 'traditional' fixators. Furthermore in a fracture situation ex-fixes are applied for open injuries, and the open periosteal stripping injury would contribute more to fracture non-union than the ex-fix itself. After the distraction regenerate is formed 'compression' allows for faster 'consolidation' of the regenerate. DMP> I agree. The non-union looks like a 'stiff hypertrophix non-union'. So, leave the nail in-situ. Remove the distal inter-locking screws. DMP> Apply an Ilizarov frame and initially distract and later compress. Luckily, the fibula has not united. 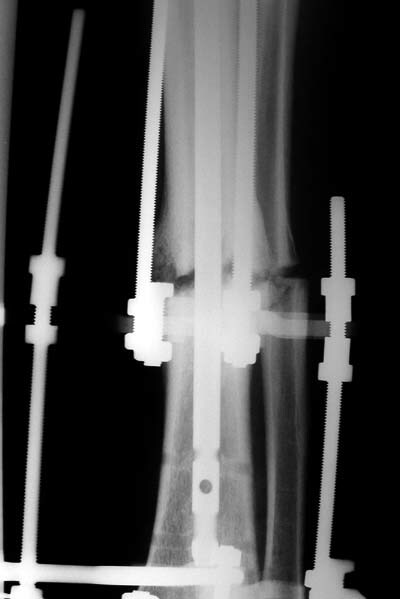 :-) It was osteotomized this week. I believe this nailed nonunion of the tibia shaft will likely go on to uneventful healing. Good job. I'm not clear if you opened the fracture site and used an awl or if you used an awl through the nail entry site. The latter is preferred although often difficult and sometimes impossible. TAD> I believe this nailed nonunion of the tibia shaft will likely go on to uneventful healing. Good job. Today the case was criticized at the week clinical report for the antecurvation deformity... Un our vice-director tries to prove that such a malalignment is of great clinical importance. TAD> I'm not clear if you opened the fracture site and used an awl or if you used an awl through the nail entry site. Yes, nailing was closed, the canal was opened through the nail entry site. I would expect the deformity of the case of nailed tibia shaft nonunion (slight apex posterior and slight posterior translation) to be of no definite and small theoretical clinical importance. 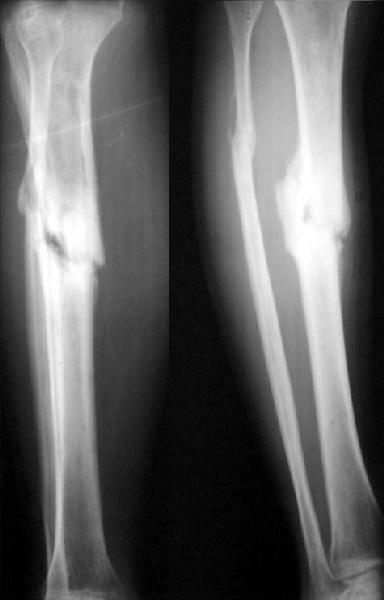 TAC> I would expect the deformity of the case of nailed tibia shaft nonunion (slight apex posterior and slight posterior translation) to be of no definite and small theoretical clinical importance. 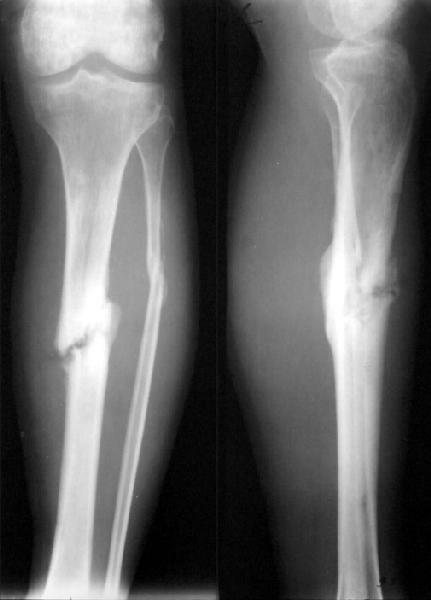 Sure malalignment of tibia shaft fractures is a fact - but is it, in such minimal degree, a significant fact? In a speech at the OTA Basic Fracture Course in Toronto, Gus Sarmiento says we are overtreating malalignment to the point of becoming "skeletal cosmetologists". The evidence he cites may be found in his 1999 OTA Specialty Day Debate with Charles Court-Brown. BB>Gus Sarmiento says we are overtreating malalignment to the point of becoming "skeletal cosmetologists". THX. It would be great to collect more such arguments if any.